In Thailand, there are many Mitsubishi Grandis on the road (I am presuming that the plural of Grandis is Grandis). These are rather large pick-ups available for around 700,000 baht. It came then as a surprise to receive from our Down-under correspondent John Weinthal, a piece on the Mitsubishi Grandis, entitled “Mitsubishi Grandis people mover”. I know that Thailand probably holds the pick-up stuffing record of 27 persons in the tray, but a Grandis ‘people mover’? It seems that as well as carrying on with that dreadful snout as first seen on the Mitsu Outlander, and now on the local Lancer, the people at Mitsubishi aren’t very original in coming up with names either, and the new people mover down-under is called a Grandis as well. That being the case, according to John, it looks good, drives well and is practical. Here are this week’s words from Weinthal. “Mitsubishi Motors is having a tough time globally for a host of reasons. These range from big losses in the US market due to some strange marketing approaches to styling changes over the past couple of years which have won far from universal approval. “However, parent company Mitsubishi Corporation has said it will pour billions into rebuilding its vehicle making arm and developing new models. Already there have been serious management and board changes in Japan following the withdrawal of backing by short-term partner Daimler Chrysler. “There is, however, at least one major Mitsubishi vehicle which was clearly developed before and during these tumultuous times. This is a people mover called Grandis. “A week in this auto-only 121 kW 2.4 litre seven seater demonstrated convincingly that this is a leap forward from both the Nimbus and Starwagon in style, performance, comfort, ride, handling and flexibility. “Grandis costs AUD 45,700 (straight conversion around 1.3 million). There’s an AUD 3,745 Luxury Pack and a dual sunroof adds another AUD 2,000. The luxury pack boosts an already very well equipped vehicle with 16 inch five spoke alloy wheels, roof rails, leather-wrapped and wood grain steering wheel and gearshift lever, some metallic-look interior touches, backlit vanity mirrors, six instead of four speaker sound system and darker windows. Personally I would pocket the money. “What really matters is that it is not only a stylish and fabulously functional device, but it is also good to drive. Around town it is nippy enough and small enough to slot into most parking spaces with ease. “On the open road it lopes along with little noise intrusion and more than enough poke for its role. Although it weighs in at more than 1600kg, the mating of the 2.4 litre engine to Mitsubishi’s ‘Smart Logic’ four-speed automatic transmission with ‘Sports Mode’ sequential shifting is a happy partnership. Claimed cruising fuel economy is 10.4 litres per 100 kilometres. “Of course it is not a sports car, nor does it ride or handle like one. It is simply effortless, comfortable and safe. Safety was clearly a priority of the Grandis design and engineering team. Grandis has ABS anti-lock brakes with electronic brake distribution, front, side and roof airbags, height adjustable driver’s seat for prime comfort, excellent halogen headlamps and an engine immobilizer. All seven seats have head restraints. “It has cruise control and air conditioning and the usual remote locking and power windows and mirrors. The middle row of seats is adjustable for legroom and seat angle. They can be folded 60/40 and there is a centre arm rest and picnic trays with cup holders in the backs of the front seats. It is a very comfortable place to ride. “The third row of seats is suitable for two children or smaller adults. It is split 50/50 and has height adjustable headrests, and a reclining function. These two seats can be individually stowed under the floor providing a huge luggage area. You can use one rear seat normally, and stow the other under the floor for carrying bulky cargo. These seats can also be flipped to a rear-facing position when the car is parked. There is a multitude of storage pockets and useful lockers throughout the cabin. With the Free Trade Agreement that has been signed between Australia and Thailand, it is conceivable that the current Holden Commodores, imported and sold here as Chevrolet Luminas could expand their line-up. General Motors Holden (GMH in Australia) has a huge model range, including the Thailand built Zafira, re-badged as a Holden. So what about this V8 for Thailand? The vehicle that our Down-under correspondent John Weinthal dubs “Just the thing for real Aussie guys”. Here are the words from Weinthal. “Back in the ’60s one could get all the impressions of performance and fun with an Austin Healey Sprite or MG Midget; neither expensive, nor fast, nor specially well built they were nevertheless the ambition of many young and not so young. Some won’t agree, but I can see parallels with the cars so many Aussies - especially males - dream of today. Few aspire to the logical successors to the Midget and Sprite like Mazda’s great little MX5 or the more expensive Honda S2000. “Nah, they’re not the stuff for real Aussie guys. Today’s dream car has a roof, five seats and a thumping V8. But it is still technically simple, makes all the right noises even when it is not really hurrying and can turn friends and bystanders green with envy. “The myth of the big Aussie V8 is a wondrous thing, milked for all it’s worth by Ford and Holden through the V8 SuperCar racing. The fact that these cars cost more than a Ferrari and contain little more than a bare shell of the showroom car is irrelevant. The image is there and that’s enough. “There’s no greater proof of the above than the metallic purple Commodore SS we’ve had for the past week, especially as it was also our transport to the V8 round at Queensland Raceway. Stuck in the traffic jams we had many offers to swap cars, some from people in far more desirable vehicles, if only they knew. “Judged as a rational car for the 21st century this SS rates about a 3 from 10. Yet its appeal for some is undeniable. “On paper this AUD 50,490 (1.5 million baht straight conversion) 5.7 litre V8 weighing in at 1660kg certainly looks right if bulk is your bag. That’s the rub. Its sheer size mitigates against true sporting delivery and contributes to a formidable thirst. “There are many lower priced cars which are more practical in a host of ways and which in the real world would be quicker in almost all circumstances bar a tearaway from the lights. “The six-speed gearbox is a heavy obstructive device with ratios which will give you nearly 80kph in first, but which deem the fifth and sixth gears all but useless. Even on mild slopes one is chasing down through the gears. “Standard gear includes climate control air, cruise control, front and side airbags, excellent automatic halogen headlamps, tilt and reach adjustable steering wheel plus height adjustable front seats. There are alloy wheels and pedals plus front and rear spoilers and side skirts. It has Holden’s rather agricultural traction control plus ABS disc brakes. “Like all Commodores it has an excellent turning circle but a serious shortage of the sort of handy storage spaces found in many much smaller cars. There are no centre front armrests nor ashtray or cigarette lighter. Aussie hero Mark Webber, currently the lead driver for Jaguar, has confirmed that he is moving to BMW Williams next year. Probably one of the world’s worst kept secrets, he now moves one more step closer to getting on the podium. 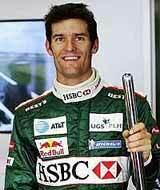 I have made no secret of the fact that I have been a Webber fan since I saw him about 10 years ago, driving a Formula Ford in the rain at Bathurst, where he blew them all away. The next interesting item will be who will partner him at Williams, since Montoya is going to McLaren and Ralf Schumacher is going to Toyota. Jarno Trulli will be out of a job at Renault, as Fisichella has been confirmed for the 2005 seat with Alonso. Perhaps Trulli? Or even David Coulthard as an outside chance! Last week I asked what was the first 500 cc car to win a hillclimb outright? It was August 1946 at the Prescott hillclimb. The clue was that it wasn’t John Cooper! The correct answer was Colin Strang with his pioneer rear engine Vincent HRD special. A very quick entry (and winner) was my old friend MacAlan Thompson from Nakhon Nowhere. That’s another beer I owe you, Mac! So to this week. Dual foot brakes with one that worked on the transmission and the other at the wheels were offered on what cars?